Yesterday, I made my very first shaker card for a graduate who is headed to FSU. 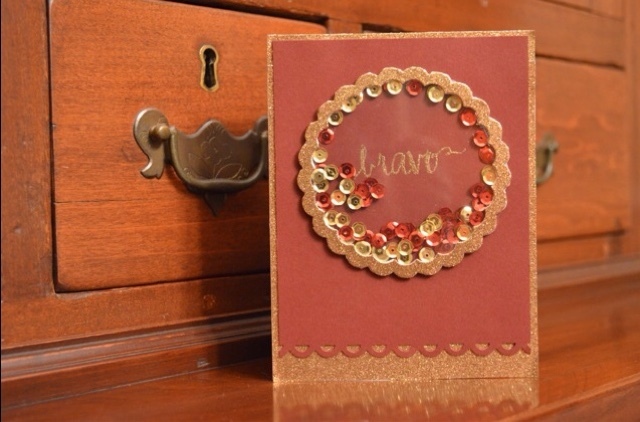 I used a gold glitter paper and a shimmery maroon paper along with matching sequins for this card. All products were purchased at Michael's. 1. I began by using a precut card base and adding a piece of 4.25" x 5.5" glitter paper on top of the front of the card. 2. I then cut a smaller maroon rectangle and used a scallop punch by Fiskars at the bottom. 3. To make the shaker portion, I began by using a gold glitter embossing powder to add my "bravo" sentiment by Avery Elle from their Oh Happy Day set. 4. I used my scallop circles dies by Sizzix to cut a foam frame, a gold glitter frame, and a piece of acetate out to make the shaker window. After adhering them together, I inserted my sequins and made sure everything was adhered securely to the card. I'll admit that I had a pretty difficult time making this card. I did redo the shaker window once! I ended up making another shaker card, and I had way more fun making that one once I got the hang of it! Thanks for checking out my blog! I will be posting another shaker card tomorrow!